Huawei has not finished releasing smartphones in 2018, and has revealed the Nova 4 — a large, bezel-less smartphone without a notch but has a punch hole in it to house the selfie camera on the screen instead. Want to switch your old device to this new Huawei Nova 4? You need a perfect transferring platform to sync everything from one phone to Huawei Nova 4. Don't worry, Syncios Manager and Syncios Data Transfer are your best choice. 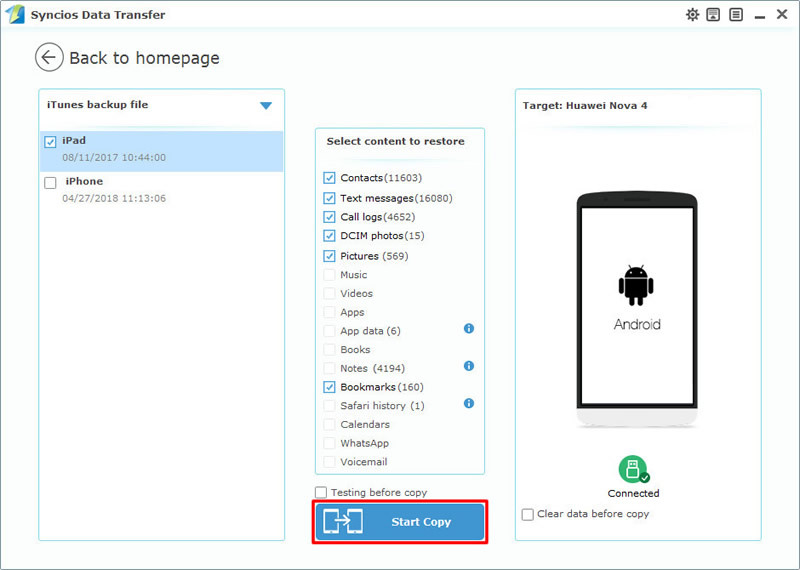 Support to transfer data directly between Android and iOS phones. Multiple categories of contents are able to transmit. Syncios Data Transfer is the most convenient way to transfer data from one phone to another. 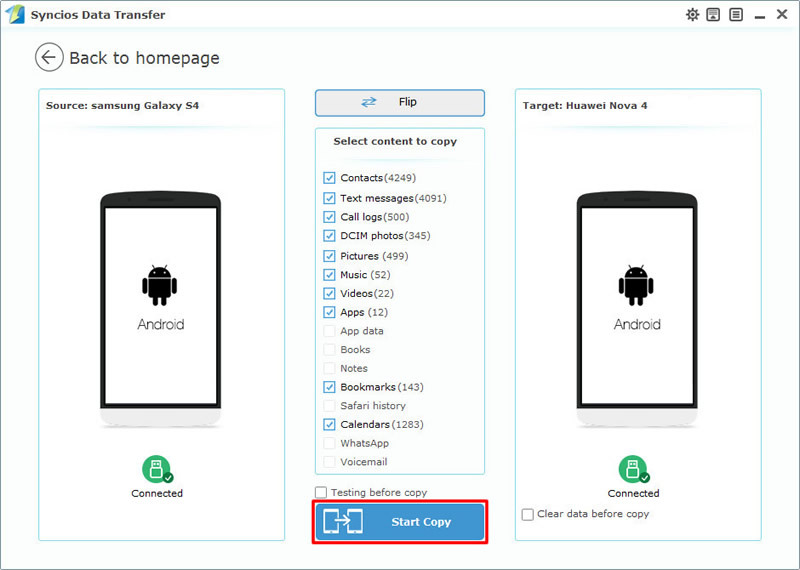 Whether iOS or Android, you can transfer data between them directly. And now, with this super powerful tool you can switch your old phone data to Huawei Nova 4 effortlessly. You can also restore iCloud and iTunes data to Huawei Nova 4. To better prepare, please download and install Syncios Data Transfer on computer first. 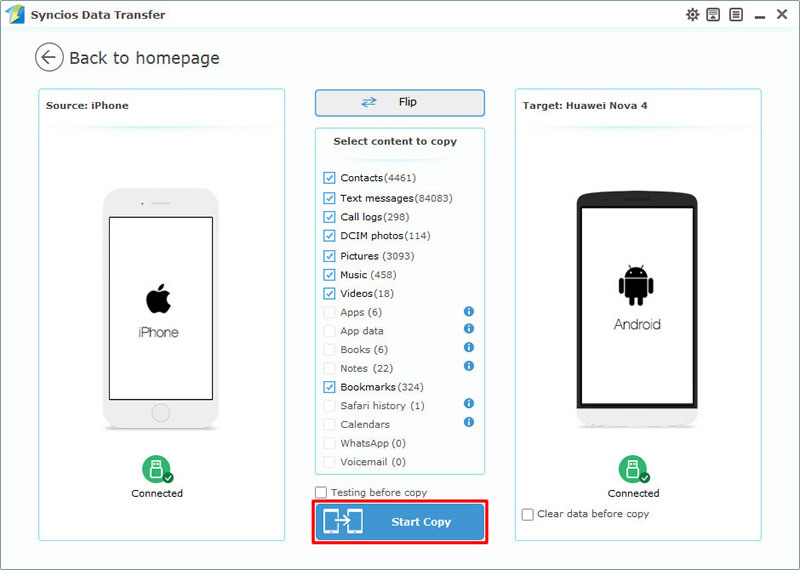 Then launch it and select 'Phone to Phone Transfer' module in the first interface. 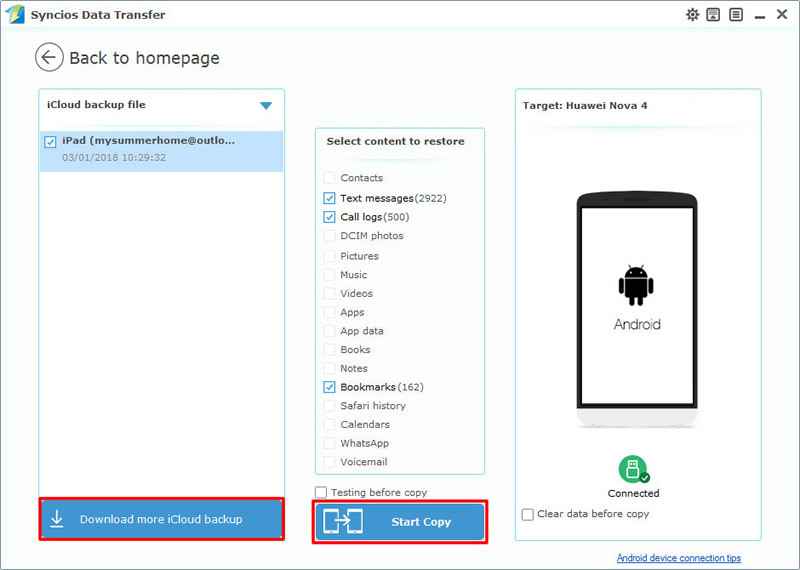 No matter your phone are Android or iOS, Syncios can transfer data between them directly. Now connect your Android/iOS device to computer, as well as your Huawei Nova 4. Please make sure Huawei Nova 4 must on the RIGHT-TARGET side. If not, click on 'Flip' to switch the positions. And now, you can choose desired contents to transfer. Just simply select the correspondent contents you would like to transfer from source device to Huawei Nova 4, click 'Start Copy' to launch. Attention: Transferrable contents will be some difference due to different operation system. 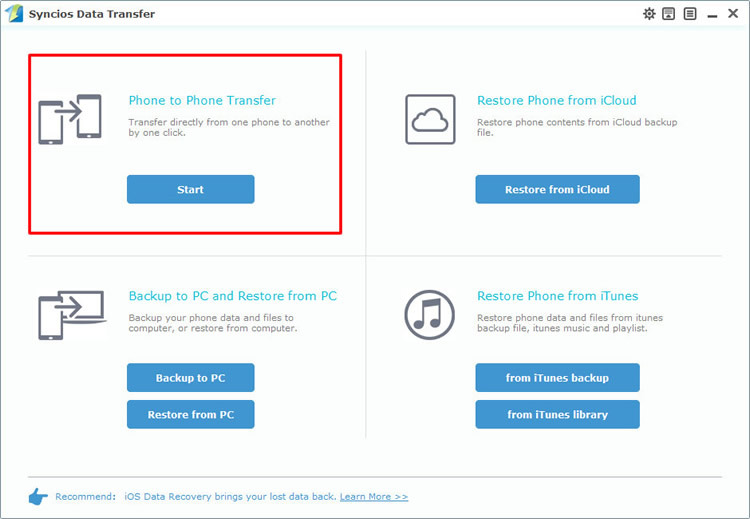 Launch Syncios Data Transfer and choose 'Restore from iCloud' option at the first interface. If you have downloaded any iCloud backup before, please select your willing iCloud backup and select the contents in the middle of the panel and click 'Start Copy' to launch. If you haven't, please click on 'Download more iCloud backup' to download iCloud backups. Login with your Apple account and choose desired iCloud backup. Then do the same steps above. This time choose 'from iTunes backup' option at the first interface. Syncios Data Transfer will detect your iTunes backup on your computer. Then do the same steps show above. Tips: Encounter any detection problem during the process, please check our Android / iOS detection tutorial for help. Syncios Manager support to transfer certain data to Huawei Nova. Apps, contacts, text-messages, music, video and photos are transmitted. Also possess with video downloader, ringtone maker and GIF maker. Firstly, please download and install Syncios Manager on computer. Then connect your Huawei Nova 4 to computer through USB cable. By using Syncios Manager, you can import desired folder or file of your needs. In this part, we will use music as a demonstration. Please choose 'Media' option on the left side and wait for Syncios to sync. Please click 'Add' button on the menu bar and select 'Add Folder' to import certain music folder. Now you can browse the music folder on your computer. Select the certain folder you want and click 'OK' to import. 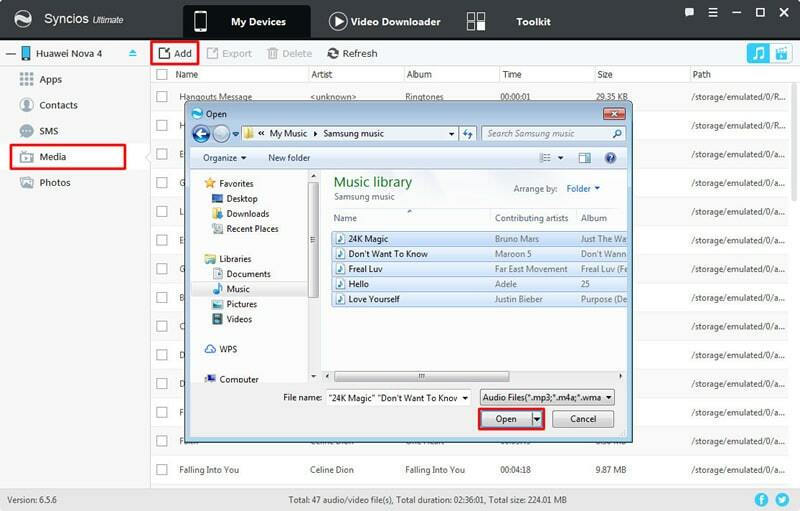 This time click 'Add' button and select 'Add File' to import certain music file. 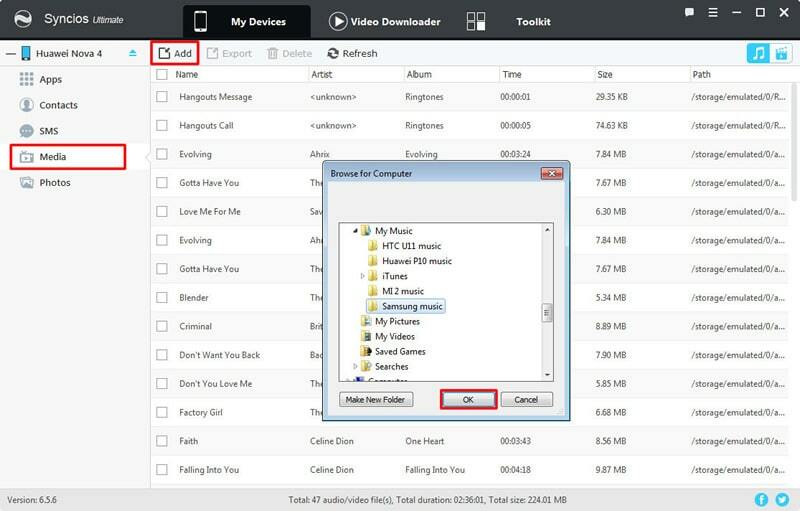 Find out your desired songs on your computer, you can select multiple songs if you want, then click 'Open' to import. Tips: Encounter any detection problem during the process, please check our Android detection tutorial for help.